:: Construction Graffiti ::: Bacon Graffiti! Happy Friday the 13th! Bacon Graffiti! Happy Friday the 13th! This is extrordinary. My friend Gemma joined the team at Atlantic Tattoo and did this masterpiece on my friend Joe. 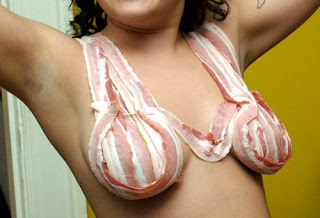 I had to look at the photo full size, because I really thought that it was four strips of bacon on Joe's body in the same vein as the Bacon Bra, seen below. 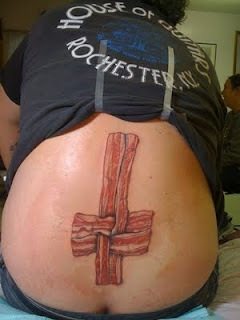 That is most definitely a love of bacon gone too far!